Modeling the flow of a dry granular material entering water is crucial to optimize blending processes in the industry or for natural hazard assessment when describing the tsunami waves induced by landslides. 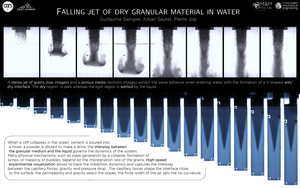 Experimentally, we consider a dense jet of grains entering from the air into a liquid bath. After an initial transient state, a stationary front appears between dry and wet grains in the bath. The wet grains are then dispersed in the liquid. To describe the dry to wet transition, we focus on the first step of the process when the liquid invades the dense granular media, modeled as a porous material. Our approach is a first step toward the description of the interplay between dry grains and liquid.